All our buildings have metal roofs with fairly steep pitches. The “modern” construction roofs have 9/12 pitches, and the old part of our house is about 12/12. The combination of pitch and slick metal means the winter snow accumulation often slides off during warm spells in winter, sometimes with thunderous consequences. We’ve had the house actually shake when chunks of snow and ice finally let go. I walked around the room listening until I determined the sound was coming from the “hip” section of the room, where the roof starts its diagonal climb to the peak. It seemed that whenever I put my ear to the correct place on the wall, that the click seemed to be coming from somewhere else along the hip. I moved throughout the room, and could not pinpoint the location. I was getting somewhat worried that it could be water, and any time I hear water dripping in the house, a thorough investigation is called for. So I reluctantly put on a coat, boots, and headlamp, and headed outside. My reluctance to go out in the cold dark was in contrast to Franko’s, who acted like he had just won the lottery, “Oh boy! 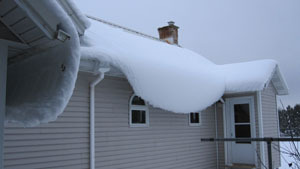 another walk outside!” There was a sheet of snow hanging over the edge of the roof that caught my attention as soon as I got out there. I shined the headlamp up there and just as I heard the click again (much louder outside) I thought I saw the overhang quiver. I stood out there for several more iterations and the results were unmistakable. The snow sheet was moving down the incline a fraction of an inch each 5 seconds, and then stopping as if pausing for breath. Later on that evening, Alice came to bed and commented that there seemed to be a clicking sound in the room. I explained the cause as I had investigated it. She said she hoped it didn’t continue for long, because she was having trouble sleeping. A very few minutes later, something gave, and the whole side of the roof slid off. We each smiled in our half sleep, and drifted off. This entry was posted on Tuesday, January 29th, 2013 at 5:47 pm and is filed under Uncategorized. You can follow any responses to this entry through the RSS 2.0 feed. You can leave a response, or trackback from your own site.